S.O.P. - Save Our Planet! Two factors will contribute to the evolution of the new: the awakening of the people to their rights and their power, and the inevitability of the turning of the Cosmic wheel bringing modern ‘Rome’ and its excesses to an end – clearing the way for the creation of a just world. While many people continue to believe that the present banking and stock exchange systems are necessary and unalterable, more and more are coming to the conclusion that they have passed their usefulness and must soon be replaced. Too many are suffering from the effects of unfettered greed, and yearn for greater justice and fairness in order to survive what is so glibly called ‘the current economic climate’. Before the economic collapse of 2008, at least in the developed world, there was plenty of money. People had work and houses to live in; new millionaires were born every day. Elsewhere, of course, millions still starved and millions more went hungry, but for some there was plenty of money and life felt good. Where has all the money gone? What has happened to it? Now, no one has work and the money has disappeared – into the banks and disappeared. And the millionaires are now billionaires. It is all very puzzling. A conjuring, a confidence trick, you would think, has been played on half the world. Will the old ways, the old time, return? Do we really want them to return with the wealth of the rich doubling daily and the poor picking up the coppers they let fall? The people everywhere are sensing a change and are lending their voices to its call. They are sensing, too, their power to act, and many die to prove it. They sense that the old ways are almost over and have spent their force. They feel that there are other, better ways to live, and look forward to tomorrow. Verily, the old ways are dying and hold back the race. The wheel turns and mighty Rome is falling once again. Maitreya’s fire is lit in the hearts of countless millions and they respond, eager to build a new world where justice and harmony rule. Maitreya’s promise is that this new world is on its way. As a solace at the end of a turbulent year which has been painful for many, we print again this message from Maitreya. Benjamin Creme received the following message from Maitreya on 31 March 2016, by a process of mental telepathy. These days are difficult for many. Even the best and the closest feel the pains of doubt and reservation. But when I say that I engage with you as one of you before the world, it is the truth. Likewise when I say that the time is close indeed when all men will recognize My face and respond, it is the truth. Only the Law bids Me wait a very little time, but within the Law I am verily with you daily, in constant rapport with your needs and the opportunities presented to Myself by you. Soon humanity as a whole will awaken to My presence and will accept with all willingness the transformation of this, our world. Remember that we are at the beginning and the end of a civilization, an epic period in the history of the world, and understand thereby that men feel the pain of change. For some it is a release into freedom. For others it is a loss of surety and calm. But, My brothers, pain will be short-lived, and already many know this to be so. There is aid in abundance to help you through these difficult times. Accept eagerly this Age and recognize the signs of the new. Verily, verily, I am with you. Verily, I am among you in many ways. Judge for yourselves, My brothers, how close you are to My expectations of a new world. This will be a world in which all men are one, in which all men fulfil the joy of creation, and fulfil with love their capacity to show the way to their brothers in simplicity and truth. Benjamin Creme did not set himself up as arbiter of the authenticity of other groups' activities and communications. Share International will continue to follow the same policy. At every lecture he gave around the world, and virtually every day of his life, Benjamin Creme was asked numerous questions covering a vast range of topics. We aim to draw on this large recorded resource and publish answers provided by BC and his Master over the years, none of which have yet appeared in Share International. Q. It is said that Maitreya’s aura covers the whole Earth. A. The effect of it, certainly; and on the Day of Declaration everybody will feel it. Q. I read somewhere that in your development you said that there were strategic changes when you started to use the orgone accumulator. Could you tell us how you built your orgone accumulator? A. The orgone accumulator was built by Wilhelm Reich [in the 1930s]. I built an orgone accumulator, but I built it in a clumsy way because I didn’t know how it could be made more simply. Today it could be made very simply, and if I was making another orgone accumulator I would make it the simple way. I did it the hard way using raw glass fibre. Have you ever played with glass fibre, up to your elbows and beyond, tearing your skin apart all the time you are using it? I would not recommend anyone to make an orgone accumulator my way! But do it a simple way by buying the requisite materials already put together. I did it as an experiment. Reich experimented with energy vehicles and found them all to be radiating an energy he called ‘orgone’. Orgone is really the etheric planes of matter, which he saw as being on one plane, but it is actually four separate planes, higher and higher. The highest is the highest you can go in this solar system. Venus, a very advanced planet in its last incarnation or round, is demonstrating the top level of orgone or etheric matter. ….. The outside of an orgone accumulator is made of soft board made from organic material, usually fibreboard, and the interior is fibreboard; the two fibreboards are filled with organic material, like glass fibre. You can now buy the fibre glass in sheets, cut to exactly the size you want. It is put between the two fibreboards and either glued together or nails are put through, fixed at the corners, so that you make a box. You have to make the box taller than yourself sitting down, so that when you are sitting it is still above your head; it is big enough for a person to get into, but not touch the sides or touch the top with your head. The inside surface of the box is metal; I used iron. The outer framework has to be metal too so that you can go into it and attach the six sections; the base, the top and four sides. You can make it with one layer or 50 layers, depending how strong you want it to be; the more layering the stronger the etheric energy will be in the box. Q. You talked about the spiritual teachings coming from Alice Bailey in the last century. Are they still usable in our current time? A. She wrote about the Ageless Wisdom Teaching which is always being updated, and the teachings released through Madame Blavatsky led to those released through Alice A. Bailey. The Master Djwhal Khul, from 1919 to 1949, worked though Alice A. Bailey and enlarged on the teachings released through Madame Blavatsky, but it does not mean that the teachings of Madame Blavatsky are no longer true. They are as true or partly true as they ever were. They can only be partly true because we can only take part of the truth – our minds could not support the real truth. Alice Bailey, Madame Blavatsky and Helena Roerich were three great exponents, disciples of the Ageless Wisdom Teaching who brought the teachings of the Masters into the everyday world, and these teachings will go on. But from now on the Masters themselves will be in the world. There are now 14 Masters in the world, plus Maitreya. Soon there will be more Masters, and then more as the need arises, as humanity becomes ready for an extension, an elaboration and a broadening, of the teachings. The Mystery Schools will be opened – preparatory and secondary schools, where people will go when ready to learn the requirements for the initiations, which end the path of evolution for Planet Earth. The last few lives of the evolutionary life are covered by five great expansions of consciousness, which we call the five planetary initiations (demonstrated in the life of Jesus) that cover the last few lives of evolution. Q. What is “our Divinity”? A. When someone says ‘divinity’ or ‘spirituality’ – people think of religion, church, temple, hands together, praying. Yes, it is all of that but it is, above all, relationship. Divinity is correct relationship. It is right relationship between people everywhere. All people, all men and all women everywhere. There are not some who are destined to be rich and powerful and rule the world, as many people think, or to grow big and fat on their investments and be powerful that way. No, it is to do with who you are, how much of your soul is manifesting through you; and how much of your essential spiritual truth as spark of the divine is manifesting through your soul, through you. You are all of that. And when that manifests you manifest your divinity. It is not something you learn to do, or go to church to do, it is something which you are. You do it naturally because it is a natural thing. 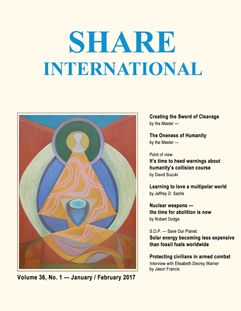 Share International has a very large reserve of ‘Letters to the Editor’ which have been processed over the years and confirmed by Benjamin Creme’s Master to be genuine encounters with Masters, or a ‘spokesperson’, but which have not yet been published. Other letters are new. While we cannot confirm or indicate if a Master is involved, the experience may be such that it ‘speaks for itself’ in providing hope, inspiration and comfort. On Saturday 23 September 2017, the weekend of the European Transmission Conference in Kerkrade, The Netherlands, I stayed at home and watched interviews of Benjamin Creme on YouTube, as well as extracts of some of his lectures. Then I clicked again on the photo of introduction of one of the lectures, and inside a kind of balloon appeared with Benjamin Creme waving his hand as if to greet me! Then the balloon disappeared. I was stupefied. I clicked again twice, and each time the balloon reappeared, with the same gesture by Benjamin Creme. Then it was all over. I felt like laughing. All this was so joyful and full of his humour – proof that he is with us. Thanks to him! L.M., Bures sur Yvette, France. Several years ago, while working at an event for the Reappearance, I was approached by strangers who said that there was somebody I needed to speak to. Later that day, that person suddenly approached and introduced herself. I told her what had happened earlier in the day, and a conversation ensued. A tremendous energy of love began to surround us both. I did not know what to say. She said that she had a message for me; the energy was so strong that it was difficult to doubt it. She began by saying that I have much work in the humanitarian field and in the United Nations, if I chose to accept it, but that I have to realize and accept my divinity. She said that I am a humanitarian in the truest sense of the word and that I have a gift with children. I could make a difference in their lives. She said that I lift people’s burdens by my presence and that I carry love, light and laughter with me that heals others. Tears were falling from her eyes throughout our entire conversation because, she said, of the love she was feeling. I also felt this strong energy of love. The lady continued and said that my field of work may be challenging, but that Maitreya is with me and I will always be safe and protected. She also said that there is a lot of work for me teaching and healing children, and talking to large crowds of people. She said that I am here to help the plan and to help awaken humanity to its potential divinity; also that there are people from other ‘worlds’ here as well as many Masters working with the plan of our planet. I was given more information and details about this work. The experience gave me a deeper understanding that there is a plan. Also, it emphasized to me that there is an area of service in the education field ahead. Hearing all this was really scary and I felt daunted, in fact, I wanted to run away and hide. At the close of our conversation, the woman turned to me and said “I have never felt so much love. Thank you for giving me this opportunity.” Indeed, the experience made me feel very loved and that stayed with me for several days. I really felt the oneness of everything and wished I could hang on to that feeling permanently. A few weeks after the tragic events of 11 September 2001 in the USA, my daughter and I were driving home from school, stuck in a traffic jam in Roehampton Lane, London. She was telling me about an upsetting incident with a teacher at school that day. We also talked about the general mood of anger and pessimism which seemed to prevail since 11 September. The drivers around us were angry and frustrated at being stuck in traffic. Some cars were sounding their horns, and jamming close together to prevent extra cars coming in from a side road. We decided to try and help lift the gloomy mood by letting a car go in front of us, which had been waiting in another long traffic queue in the side street. The driver of the small red car seemed absolutely overjoyed to be let in. He hung out of his window and beamed and waved at us, shouting “Thank you! Thank you!” As he drove ahead, he continued waving wildly back at us out of the window, until he turned off further up the road. He was so incredibly happy that we laughed, and our mood was completely lifted. The driver looked similar to the ‘homeless man’ in the video of Maitreya when He appeared in a New York library – he was Afro-Caribbean, aged in his 50s, with medium length curly hair. Was the laughing driver someone special? This occurred on a Sunday morning in August 1998. I was on my way to Transmission Meditation in Berkeley. As one exits the freeway, the road changes from two lanes into one. An orange sports car, I think it was a Mazeratti, merged in front of me. My attention was drawn to it because the paint on the entire car was very flat, no shine at all. A little further down, the road changes back to two lanes and the Mazeratti was now next to me to my right. Since the drive to Transmission Meditation is about 40 minutes, I eat my breakfast in the car to save time. While sitting at a red light I was being annoyed by the whine of the Mazeratti’s engine. I thought: “How could someone pay such an exorbitant amount of money for a car that is so noisy?” My window was rolled down, and I heard the man in the Mazeratti say: “That looks good,” referring to the bagel I was eating. He was smiling a big, friendly smile. I smiled back and said: “Yes, it is.” The light turned green. I started to go but realized the lanes were merging again into one so I slowed down to let him go in front of me. I said to him: “Go ahead.” He said: “No, no. You go ahead,” which I did, and I waved a ‘thanks’ to him with my ‘bagel’ hand. He was very good looking and distinguished. He looked to be in his 60s in age. His hair was pure white, and it looked like he had a very expensive haircut. He had a full, white beard that was short and perfectly trimmed. The word ‘immaculate’ comes to mind. I didn’t give him another thought until just before I got to Transmission Meditation when I jokingly thought: “Oh, yeah, that was the Master Jesus saying ‘Hello’ to me again.” (Benjamin Creme had just confirmed some experiences with the Master Jesus a few days earlier.) I always think about the man in the orange Maserati every time I come to that intersection on the way to Transmission Meditation. Was this another encounter with the Master Jesus, or perhaps Maitreya? I would like to report an extraordinary story which happened to the father of a group member. Her father, diagnosed with cancer, was in hospital in Kiel, in Germany, at the time. His daughter gave him a wonderful picture of a cross of light. He fixed this on the wall, so that he was able to see it at all times. On 26 July 1999 he was put on Benjamin Creme’s Master’s healing list. A few days later he woke up at night. He could see the cross of light in a bright light. Then he felt this light entering into his body. As a very realistic man he usually does not believe such things can happen. His daughter would like to know: was it a fantasy or was it a Master helping him? Since this event he has the feeling that whenever he looks at this cross of light he feels that the light is still in the picture. On 20 October 2017, driving to a Mind Body Soul Fair at Alexandra Palace, London, I suddenly had a strong urge to stop and buy some roses for our stand, and chose three white and three pink roses from a local florist. They looked perfect on the table and I sent a photo to a co-worker who loves flowers and usually organizes them, but is not well. At about 4pm a little white-haired elderly lady came to our stand. She looked quaint and sweet: she wore a pink woollen knee-length coat, a white polo-neck jumper and on her head a white hat with a pink hat on top! She matched the colour of our roses exactly! I remarked to a co-worker what a sweet-looking woman she was and walked to the front of the stand to greet her. She peered at me from behind her glasses, and I stooped slightly to talk to her. We had a very lively chat about Maitreya, Benjamin Creme’s role, the need for unity and the fact of humanity’s oneness. We agreed on everything and she seemed to already know everything! She told me that this information is also in the Jewish esoteric teachings. Saying goodbye we hugged and she placed some free literature into her shopping trolley. At the time I had been feeling a bit low and tired but found the encounter wonderfully joyful and uplifting, and with a message to share. One week before Christmas 1999 in the early afternoon, I stepped into the underground on my way to see my mother in an old people’s home. There was a Sinti or Roma family right in front of me: father, mother with a baby, and four more children of different ages. They seemed in total unity. I was fascinated and could not stop looking at them. The elder daughter played around with a pencil and tried to paint her younger sister’s eyebrows. I said: “Be careful when the underground stops.” The father also said something to her with a friendly relaxed tone but in a language I couldn’t understand. Then I had to move to find a place to sit. I offered a seat to the lady with the little child, so I could sit in front of her. She only had eyes for the baby which looked very healthy, happy, and in deep sleep. The mother opened the sling and took the hood off the baby’s head. She did it in such an extremely simple and tender way, that I felt in awe, deep in my heart. She didn’t look at her family but you could feel the bond between them. The whole family seemed so natural and perfect at the same time. Was this only a good experience of cultural differences, or was the family a group of members of the Spiritual Hierarchy? I feel compelled to write and ask about an experience. At Christmas 1995 my daughter had borrowed my car to go to Nelson, British Columbia, Canada, with her children. She was driving between Salmo and Nelson on 30 December, when the car hit some black ice and left the road, going down a steep slope some five metres, and hitting a tree. She said that it was a miracle the car didn’t roll, given the steepness of the slope. Also she felt that the car was being almost carried; it seemed to gain no speed and hit the tree so gently that there was damage done only to the front left fender. The children weren’t scared at all; they wanted her to ‘do it again’ as it was fun for them. I had asked that Maitreya take care of them, in prayer. Was this His doing? I believe so and thank Him for it. If not, thanks to Whoever it was! "Gradually, we must assume, many will begin to see Maitreya as the One awaited by all religious groups under their various names, and will call Him thus. Some will say: 'He must be the Mahdi,' while others will declaim: 'Krishna has come again, the law is fulfilled!' Others will ask: 'Surely he is the Messiah, come at last,' while still others will see Him as the Christ or Maitreya Buddha. All will see Him as their Expected One, fulfilling their hopes and come to fulfill their needs. With the recent dramatic events relating to North Korea’s missile tests I thanked the Space Brothers for their work of mopping up some of the nuclear radiation on our behalf. I was going to Trouville, Normandy, in France, and before I left I hoped for a beautiful sunset and more! On the evening of 3 September 2017, I sat looking out of my window at 8.10pm. It was no surprise to me that the sunset was superb and I watched it for about 20 minutes and took some photos. Looking at the last photo (above) in this series I felt a strong energy which moved me to tears. I thought about sending the enclosed photos, knowing that I can no longer ask Mr Creme to ask his Master to confirm them. That night I saw Benjamin Creme in a dream. He looked at me fixedly, asked me something and then said, “Au revoir”, waving goodbye. The Solar and Heliospheric Observatory, SOHO, is a project of international collaboration between the European Space Agency and NASA to study the sun from its deep core to the outer corona and the solar wind. A variety of objects, including several Deva-like images, fill this photograph taken by NASA SOHO on 29 August 1997, two years after its launch in 1995. This photograph has only recently come to our attention. We present it for your interest. Panel depicting Saint James painted in 1472 by Carlo Crivelli was photographed by B. G. (The Hague, the Netherlands) in the Brooklyn Museum of Art in New York. James is the Patron Saint of pilgrimage. He joined Jesus in prayer before Jesus was arrested. On development the photograph showed a light blessing confirmed by Benjamin Creme’s Master to be from Maitreya. Light blessing on a photograph of B.M. from Venezuela taken by F.R., Ohio, USA, while they were attending the Theosophical Society’s Summer School in Wheaton, Illinois, USA, in July 2001. Benjamin Creme’s Master confirmed that this was a blessing from the Master Jesus. Sometime in 2015, a New York policeman who had been going through a difficult time, took some pictures of himself and his family on his iPhone. When he looked at his phone all the pictures had vanished except for one which he did not recognize and did not remember taking. He went to a phone shop who confirmed that there was no indication the picture had been transferred or sent to him. It had to have been created on his phone. He asked around, hoping someone would recognize the image, but without success. Recently the story reached pastor Father Patrick Longalong from Brooklyn who placed it on his Facebook page and contacted deacon Greg Kandra, who recognized it immediately and shared the story on his website. We present a selection of quotations on the theme of ‘Synthesis’. The quotations are taken from Maitreya (Messages from Maitreya the Christ and Maitreya’s Teachings – The Laws of Life), Benjamin Creme’s Master (A Master Speaks and Share International), and Benjamin Creme’s writings. The new energies of Aquarius, mounting daily in potency, are already making their presence felt, and lie behind the changes, in every sphere, which are now occurring on a global scale. These changes must, and will, reflect the quality, the inner nature, of the Aquarian energy – namely, Synthesis. These energies of Synthesis, fusing and blending the different strands of our multifaceted life, have the task of bringing humanity to an awareness of its Oneness, an appreciation of its part in the Great Plan, and an ability to manifest that Plan in right relationship on the physical plane. A great Avatar, the Avatar of Synthesis, has been invoked by Hierarchy. Standing behind and working through the Christ, the energy of this Being works through Hierarchy as a group and humanity as a group. It works through the United Nations Assembly as a group (not through the Security Council, whose members have a veto and work against group expression in the United Nations). The energy of the Avatar, a synthesizing, fusing, blending energy, flows through the United Nations Assembly, blending eventually the nations of the world into one serving unity. They will then serve the world as a whole instead of their own separate national interests, as they do now. I am happy to be able to speak to you once more, and to tell you that I come to take you with Me into the New Country – the Country of Love, the Country of Trust, of Beauty and Freedom. The synthesis of ideas underlying Our multifarious presentation springs from Our sense of the unity of all things, from Our constant awareness of the Whole and of the indivisibility of that Reality. When men share this experience all things will become possible. …the old, outworn structures are losing their stability and coherence, thus clearing the ground for the construction of the new-age forms. These new forms must embrace the ideals and aspirations of all men for a more just world, a world no longer torn and divided into rich and poor, powerful and weak. They must, above all, embrace the idea of synthesis, the inner, spiritual intention of the Aquarian dispensation. Humanity will come into the total understanding that we are one group called humanity, that there is nothing separate in the whole of cosmos, that everything relates to everything else, that the laws that connect humanity are the laws built out of the non-existence of cleavage of any kind throughout cosmos. Many will see Me soon and at first may be surprised at My appearance, for I am not the Preacher of Old, but have come simply to point the way, to show the path which must be trodden, back to the Source and into Harmony, Beauty, and Justice. Alzheimer’s disease is a neuro-degenerative illness currently considered to be incurable. No effective treatment appears to have been found to date. In 2014, Dr Dale Bredesen, professor of neurology at the University of California in Los Angeles (UCLA), posited an innovative hypothesis: what if this disease was brought on by a combination of chronic stress and serious deficiencies relating to our modern lifestyle? He set up an experiment with 10 patients diagnosed with early symptoms of Alzheimer’s. He offered them a personalized program and support to help rebalance their habits and lifestyle. The results obtained after six months were more than convincing. After completing the program, eight patients, suffering from relatively light symptoms, fully recovered their lost capacities. In fact, they felt even better than they had before the onset of the disease. Six of them were able to go back to work. By following the program on a long-term basis, they proved to be completely cured. So, with early Alzheimer’s, symptoms could be reversed provided the patients modified their behavior. This raises questions about our lifestyles and about the root causes of Alzheimer’s disease. In his book Guérir Alzheimer: Comprendre et agir à temps Dr Michael Nehls [Curing Alzheimer’s: Understanding and acting in time; not yet available in English] explains the genesis of the disease and ways to prevent and cure it in its early stages. How does the memory work? It all starts with the hippocampus and its role [The hippocampus is located under the cerebral cortex.] During the day, this small structure collects the information that will then be forwarded to the area dedicated to long-term memory, during deep sleep at night. A substance called amyloid beta is produced, in order to stabilize the immediate memories, before they are archived. So the hippocampus establishes an area of temporary storage. However, it remains the custodian of the recall information, which will allow us to bring back to memory what we learnt before. Obviously, therefore, it plays a fundamental role in memory. To be able to store more information every day, the hippocampus is continuously producing new neurons – at any age. These brand new neurons can become integrated into the existing network only if they are mobilized. And so it is essential that we use our ability to learn in order to stimulate neurogenesis [the growth of new neurons] and to benefit from new connections. The hippocampus better records information when learning conditions are positive. The place and the moment when we receive the information, as well as the emotional connotation experienced at that moment, are all crucial. The more significant the new information, the more concerned we feel, the easier the recall of this memory. To be able to work, the hippocampus needs human interactions, coherence and friendliness. The more our body endures stress, the more the brain secretes amyloid beta which is normally eliminated during sleep. When the disease manifests itself in more and more obvious memory loss the brain displays higher levels of amyloid beta which paralyze its functions. An excess of production of amyloid beta becomes toxic and the brain no longer eliminates it. A definite diagnosis is achieved through brain imaging. It is also clear that neurogenesis is no longer taking place. Alzheimer’s disease begins slowly, with a progressive disorder of the hippocampus that takes years to develop. Our physical body endures chronic stress caused by pollution and the consumption of ever more artificial food. The addiction to screens (computers, cell phones) over-stimulates the nervous system, bombarding it with continual, artificial and incoherent stimuli…. How to reverse the process? Physical activity – Movement, such as walking, in particular, stimulates the activity of the hippocampus. Physical activity helps the brain to eliminate the amyloid beta excess. Mice, into which amyloid beta aggregates had been injected, were able to eliminate completely this toxic substance just by running inside a wheel. Patients affected by Alzheimer’s saw their mental abilities considerably improved after a period of significant physical activity. We now understand better why people who are ill often naturally feel the need to roam around as if trying to stimulate their brain. Because they fail to understand this need, many retirement homes tend to keep their sick elderly residents stuck in their rooms. In homes where they are left free to walk around at their convenience and where regular physical activity is encouraged, aggressive behavior is reduced and the disease evolves more slowly. Daily physical activity was therefore part of the program offered to Dr Bredesen’s patients. Feeding the brain correctly – A diversified food program, including healthy and freshly cooked products, natural food supplements as well as a daily intake of coconut oil, enabled Dr Bredesen’s patients to make up for the deficit of brain ‘nourishment’. ‘Industrialized’ food, stuffed with added sugars, tends to create an insidious Type-2 Diabetes. The brain is not able to absorb the glucose it needs anymore, and it then suffers from nutritional deficiency. This could explain the tendency in the elderly to crave sweets. This is an unconscious attempt to stimulate their brain cells which are slowly dying of starvation. How to feed the brain when this disorder is present? The liver can transform fats into ketones, which are substitutes for glucose. Ketones are able to reach the brain and provide the food it needs. This is what allows us to remain in good shape when we fast. Coconut oil, taken as food supplement, compensates for the deficits in nutrients of the brain. It considerably stimulates the capacity of the liver to produce ketones. The composition of coconut oil is close to that of breast-milk. It is used in hospitals to cure children with serious epilepsy as well as the cerebral traumas of war-wounded soldiers. Dr Mary Newport* carried out a study about the benefits of a daily intake of coconut oil to help the sick. Patients testify to their recovered capacities: their brain, now fed correctly, begins to function again. The program included support for patients to add meaning to their lives. Learning something new every day and finding some purposeful activity to participate in were part of the program. Rather than mechanical exercises, it is varied and engaging social interaction that stimulates the hippocampus to start working again. The new neurons, because they are mobilized, create connections and thus become integrated into the existing network. So, the nervous system succeeds in mitigating deficits due to age. Being involved in an interesting learning activity, adapted to the interests of the patient, in a supportive and friendly environment, helped to restore in each patient the impetus to do something of value to them. Once they emerged from their isolation, the patients were able to rediscover a quality of life far better than they experienced before becoming ill. This whole program revived the regulating and self-healing power of the human body, naturally restoring previously disrupted functions of the brain. Women Wage Peace (WWP) is a grassroots movement of Israeli women of different ethnic, social, political, religious and geographic background whose goal is to reach an “honourable and bilaterally acceptable political agreement” of the Israeli-Palestinian conflict by 2018. In their own words, the movement was “born out of deep despair and cynicism” following the July 2014 military operation – known as ‘Operation Protective Edge’ – launched by Israel in the Gaza Strip. The result was devastation to large parts of the Gaza Strip with many casualties in both Gaza and in Israel. The movement was initiated in order to rekindle hope for peace between the two sides. WWP has been very active and is growing rapidly, with over 28,000 members in Israel with an additional 50,000 supporters worldwide. WWP regularly organizes activities to put pressure on the leaders of Israel and Palestine to work towards a viable peace agreement. Shereen Tayles interviewed Vivian Silver, a member of WWP’s Central Committee, for Share International. Share International: What are some of the activities you undertake to bring awareness to your cause? Vivian Silver: First of all, we are not a hierarchical movement. It’s a flat organizational structure run entirely by volunteers. We are divided into 18 professional teams and 60 geographical areas. We are trying to grow the movement so we become a critical mass of people who will then be able to impact politicians and our government. We run parlour meetings in different cities – as I say we have 60 geographical areas, so each area runs its own parlour meetings – where we have shown Abigail Disney’s movie Pray the Devil Back to Hell, a movie about the role of Liberian women in ending their civil war. And then we hold discussions about the similarities and differences and we use it as a motivational film to get women to be active and to say: “If they could do it under their terrible conditions there, we can do it here as well.” So that’s on trying to explain who we are and to recruit more and more women to our ranks. Every month on a Thursday afternoon, we stand at junctions in Israel throughout the country. We stand at about 80 junctions or in shopping centres holding our signs that show Menachem Begin, Anwar Sadat and Jimmy Carter when they made the original peace agreement between Egypt and Israel. The image shows that this is not a partisan issue because Begin was a right-wing Prime Minister from a very right-wing government. And that’s our message; that this is not a left-wing movement and it’s a movement that covers all political strands because peace is an overriding issue for everybody. So that’s our message standing at the junctions; to say you can be religious, you can be secular, you can be right wing, you can be left wing, you can be mainstream, you can be a Russian immigrant or an Ethiopian immigrant or native born – this is an issue that speaks to everyone. We are also at the Parliament every Monday and our geographical teams take the responsibility for who is going to be there. We are at the plenum at the Knesset, the Israel Parliament, and we have become very well-known as a peace movement that they can’t ignore. We are in the Parliament, we participate in committee meetings, and we participate in the plenum and the politicians who address the Parliament have addressed us as well. They recognize us as we dress in white with turquoise scarves, so we are very visible wherever we go. SI. Has your group had an impact on the peace process so far? VS: On the actual peace process, not yet, but politicians have said that we have made it legitimate once again to talk about peace and to envision hope and to rattle the status quo; that is to say that the paradigm we have been taught for 70 years that only war will bring peace is clearly not true and so we are changing the paradigm to say only a political agreement will bring security. Security is an existential need of all of us, whether we are Jewish or Arab, whether we are Muslim or Christian or whether we are Palestinian or Israeli – everybody in the world needs to feel secure. Being women, our concept of security is broader than just a defence security – we are talking about human sustainable security in education, welfare, employment and economics. So security has to be looked at in a much broader fashion. ST: To what do you attribute the movement’s success? VS: We are a pragmatic movement as opposed to an ideological movement. Most peace movements remain very small because they stick to a very narrow ideology and so they splinter a much larger peace group into very tiny groups who hang onto their ideological slant. We decided from the beginning that we are a one-issue movement, period. And we are not going to advocate any particular political solution, because it really doesn’t matter to us. As long as it’s bilateral and accepted by both sides, it will by definition be an honourable agreement for both sides. Otherwise it won’t be accepted. So we don’t get into which peace agreement. What we are saying is that you have to decide you are going to reach an agreement and not get up from the table until an agreement is reached. The other source of success is our approach to diversity. We insist on reaching out to people of all political views, of all religions, of all socio-economic statuses, all ethnic groups so that by having such a wide and diverse membership, we are speaking to much, much larger numbers. As women, we are developing a new language. We are getting away from the blaming and shaming pattern and we are really adopting what Professor Carol Gilligan has called “radical listening”, where we work very hard to hear the other person and accept the fact that there are very different opinions and they have to be accepted…. SI: How can women not living in the area support your cause? VS: Around the world there are Women Ambassadors for Women Wage Peace – women who want to support us and who carry out activities in their cities in identification of what we are doing. So, for instance, during last year’s  March of Hope in October, San Francisco had a march on the Golden Gate Bridge. Chicago is talking about doing an event for next year’s Flagship Project. Brazil just had a major event, Italy and Spain have just had major events; so there are things happening all over the world. Different countries have invited Yael Deckelbaum, a singer who wrote ‘Prayer of the Mothers’ to come and sing at events that they carry out in support of WWP. You find her on YouTube performing in different countries. It has really been extraordinary. She has her own ensemble but it has been a synergetic relationship between her and the movement because she wrote the song on her own and then because of our activities, she has been catapulted to world fame and the movement has benefited because of her song. So it has really been good and something very special. SI: Is there anything else you would like to add? VS: We just had a successful event of two weeks of activities in September and October 2017. The last day of our two-week march all over the country brought Palestinian women and Israeli women together just outside of the Dead Sea in the tent that we created called the ‘Tent of Sarah and Hagar’, symbolic of the age-old conflict that we are coming to resolve. In fact, 2,500 Palestinian women came. It was a great sign that says there are partners on both sides. We have been told for so long that we don’t have a partner and we are saying that we have to first be the partner we want on the other side. They are there. There are men and women in Palestine who want the same as we do. For centuries the dominant scientific worldview has been premised on conclusions stemming from classical or Newtonian physics, which asserts that nature is a grand mechanism composed of material parts, and understanding complex organisms is a matter of reducing them to the interactions of their parts. Classical physics indeed has led to discoveries, understandings, innovations and technologies that have greatly contributed to improvements in virtually every aspect of human living and propelled us into space. Early in the 20th century, however, a number of physicists (several of whom would eventually be Nobel Prize winners) explored the relationship between matter and energy and discovered empirical phenomena that could not be explained by classical physics, namely that what we perceive to be solid physical matter (including atoms) is actually interactions, or “entanglements”, of energy waves. Some of the group went further and developed experiments demonstrating that consciousness, or mind, is linked to these energies and therefore can affect the material world. These discoveries were the basis for a revolutionary new branch of physics: quantum theory or quantum mechanics. Whether it is realized or not, quantum theory reflects two of the basic tenets of the Ageless Wisdom Teachings – that (1) there is nothing in the whole of the manifested universe but energy in motion and (2) energy follows thought. Recently, a team of researchers from Massachusetts Institute of Technology, the University of Vienna, and institutions in Germany and China, developed an experiment that indicated – with much less room for doubt than heretofore – that subatomic particles even light years apart can be entangled, or ‘share’ the same information and existence. (1) This could be a step toward an eventual recognition and understanding of the profound statement by Benjamin Creme’s Master in his article ‘Unity’ (Share International, July/August 2001) that “the underlying purpose of all life is the creation of unity, thus expressing the interconnectedness of all atoms”. In parallel with experiments in quantum theory is the increasing study worldwide of heightened states of consciousness – from meditation, to numerous psychic or “psi phenomena”, to conscious awareness after clinical death (called “near death experience” or NDE) which is now being reported and documented so frequently it cannot be considered anomalous. (See the interview in Share International, July/August 2017 with investigative journalist Leslie Kean, author of Surviving death: A journalist investigates evidence for an afterlife.) This recurring experience indicates that mind exists independently of the brain. Here, again, the above investigations have revealed phenomena that cannot be explained by the materialistic-mechanistic view of reality. But despite the empirical evidence of quantum theory and the results obtained by paranormal consciousness investigations, it appears that many, if not most, mainstream scientists, science writers and academics remain staunchly faithful to the materialistic worldview as the exclusive basis for explaining reality. They tend to look upon these new frontiers with skepticism, ridicule, even incomprehension. This dominant materialistic paradigm, or “scientific materialism”, is more like an ideology – science as dogma rather than open-minded, open-ended inquiry. We might view this schism as an example of the polarization between those conditioned by the ebbing energies of the Piscean Age, with its over-developed and misused gift of devotion to an ideal – a divisive, fanatical devotion to one’s own ideals and worldview to the exclusion of others – and those experiencing a shift in consciousness from the increasing energies of Aquarius, which stimulate ideas about holism, synthesis, interconnectedness and the subjective, non-material aspects of reality…. “... Man is in fact a fragment of the Universal Mind, or world soul, and as a fragment is thus partaker of the instincts and quality of that soul, as it manifests through the human family.” — The Master Djwhal Khul (DK), from A Treatise on Cosmic Fire. The second part of the manifesto sets out the points which the conference participants concluded are important components of the emerging post-materialist paradigm. Rather than summarize, I think quoting a selection verbatim will have more impact and allow readers to see in them reflections of the statements by BC’s Master and the Master DK quoted above. The manifesto also contends that this new paradigm can foster “positive values” such as compassion and mutual respect, as well as a stronger concern for the environment due to an understanding of our interconnection with the natural world. In other words, right human relationships – with ourselves, with others, and with nature. All of the individuals involved with the manifesto, and those who have been inspired by it, recognize that getting the post-materialist worldview accepted as a subject for serious consideration is currently a rough road to travel. The materialist ‘old guard’ still dominate mainstream information sources. To date, I have found no record of a mainstream science publication or elite news organization publishing, discussing or even acknowledging the manifesto. But we can be confident the new energies now pervading the planet – from Maitreya, the Masters of Wisdom, Aquarius and other cosmic sources – are gradually dissolving the obstacles and smoothing the way forward. Delegates from nearly 200 countries met in Bonn, Germany, in November 2017 for the 23rd annual UN-sponsored ‘Conference of the Parties’ (COP), the ongoing international effort to halt global warming. This year’s summit, chaired by the climate-vulnerable island nation of Fiji, focused on creating a ‘rulebook’ for monitoring and strengthening the climate change pledges made by many of the world’s nations in the landmark Paris agreement of 2015. Progress was made on that goal, but most of the major developments during the conference took place outside the official proceedings. Before the summit began, Syria announced its intention to sign the Paris agreement, leaving the US, the world’s second largest emitter of greenhouse gases, as the only country that has rejected the accord. In an attempt to fill the void of US government inaction, California governor Jerry Brown and former New York City mayor Michael Bloomberg released the ‘America’s Pledge’ report outlining non-federal climate actions now taking place in the US. Among its findings: a total of 20 states, 110 cities, and over 1,400 businesses in the US have adopted quantified emissions reduction targets. If these non-federal actors were a country, their economy would be the third largest in the world. The America’s Pledge initiative is working to help ensure that the US meets its Paris commitment to reduce greenhouse gases, even without US government support. In another positive development during the conference, The Powering Past Coal Alliance was launched. Led by the UK and Canada, the alliance is made up of more than 20 nations, regions and states that have pledged to phase out the use of coal, bar further investments in coal-fired electricity, and support clean power in their policies. Although the alliance does not include major coal users, including China, the US and Germany, the plan is to grow the alliance to 50 members by next year’s UN climate summit. A transition to 100 per cent renewable electricity throughout the world is not a long-term vision, but already a reality, a new study by the Lappeenranta University of Technology (LUT), Finland, and the Energy Watch Group (EWG) shows. The study was presented on 8 November 2017 during the Global Renewable Energy Solutions Showcase event (GRESS), alongside the United Nations Climate Change Conference COP23 in Bonn. The study reveals that a global electricity system fully based on renewable energy is feasible at every hour throughout the year, and is more cost effective than the existing system, which is largely based on fossil fuels and nuclear energy. Existing renewable energy potential and technologies, including storage, can generate sufficient and secure power to cover the entire global electricity demand by 2050. Lead study author and LUT Professor of Solar Economy and Chairman of the EWG Scientific Board, Christian Breyer, said: “A full decarbonization of the electricity system by 2050 is possible for lower system cost than today based on available technology. Energy transition is no longer a question of technical feasibility or economic viability, but of political will”. A transition to 100 per cent renewables would bring greenhouse gas emissions in the electricity sector down to zero and drastically reduce total losses in power generation. It would create 36 million jobs by 2050, 17 million more than today.